what is SQL Server 2005 reporting service? 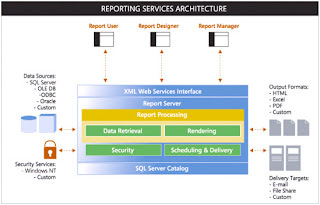 SQL Server Reporting Services supports a wide range of common data sources, such as OLE DB and Open Database Connectivity (ODBC), as well as multiple output formats such as familiar Web browsers and Microsoft Office System applications. Using Microsoft Visual Studio .NET and the Microsoft .NET Framework, developers can leverage the capabilities of their existing information systems and connect to custom data sources, produce additional output formats, and deliver to a variety of devices.